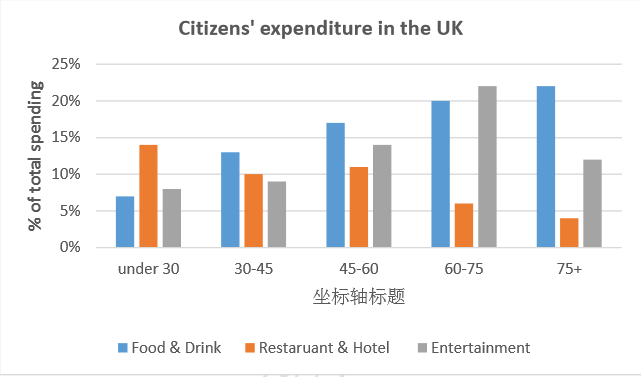 The chart below shows the expenditure on three categories with different proportions among residents in the UK. 作文题目：Some students take one year off between finishing school and going to university, in order to travel or to work. Do you think advantages outweigh disadvantages? Some school leavers travel or work for a period of time instead of going directly to university. What are the advantages and disadvantages? In some countries,some high school leavers are choosing to work or travel for a period of time before going to the university. Discuss the advantages and disadvantages for those school leavers’ decision. Some people believe that some unpaid community service should be a compulsory part of high school programmes (e.g. working in a charity, improving the relationship of neighbourhood or teaching sports to children) To what extent do you agree or disagree?